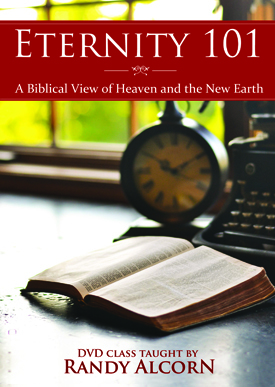 Resources for the Eternity 101 Class on Heaven taught by Randy Alcorn at Corban University, and available on DVD exclusively from EPM. This course will help you gain a better understanding of our eternal dwelling place. We’ll talk about the pervasive myths and misconceptions about Heaven, and seek to answer from Scripture the most frequent questions about life after the resurrection, on the New Earth. During the course, we’ll address the central question of whether there is a continuity or discontinuity between our present life on earth and our future life in Heaven. We’ll also discuss the question of what difference it makes whether we set our minds on Heaven while we still live on earth. The course will give special emphasis to the New Earth as God’s central eternal dwelling place, and the place we will live and serve King Jesus. We’ll explore together the far-reaching redemptive implications of Christ’s work, culminating in a resurrected universe delivered from the curse. My hope is that this course will bring eternity to light in a way that will surprise you, spark your imagination, draw you closer to Jesus, and change how you live today. In this 2-minute video, Randy welcomes viewers to the Eternity 101 class. Browse more articles and media on Heaven. For more resources on Heaven for pastors and leaders, including a free Heaven Pastor's Kit, please see our Heaven Resources Page. In this three-minute video, I share about an upcoming graduate course on Heaven I’ll be teaching at Corban University in Salem, Oregon May 8-10, 2012. Randy Alcorn gives guidelines for sharing the information taught in Eternity 101: www.epm.org/heavenstudy-differences. This video clip was excerpted from Randy's Eternity 101 DVD class. What Is the Difference Between the Eternity 101 DVD Class and the Heaven Small Group DVD? An easy-to-read chart showing the difference between these two DVD resources available for the study of Randy's Heaven book. Randy Alcorn shares about using available study materials as companions for study of his book, Heaven. This clip could be used to introduce an upcoming class or as a welcome introduction to the Heaven study. Resources pastors and group leaders can use on the subject of Heaven.